PM parts are formed from metal powder that is pressed together in a die and then sintered. Metal injection molding (MIM) is a complementary process that also uses metal particles—just much finer— to produce high-density components with three-dimensional design flexibility. The question of when MIM represents a viable option compared to the traditional powder metallurgy (PM) technology is a complex one, but there are a number of factors that can be taken into account. PM and MIM utilize the same base powders and both processes allow for the use of custom alloys, however, the key difference in material is particle size. Coarser powders used in PM are widely known and the route to make them are inexpensive. MIM powders are much smaller so the process and energy to make them—in that size range—are more expensive to produce. 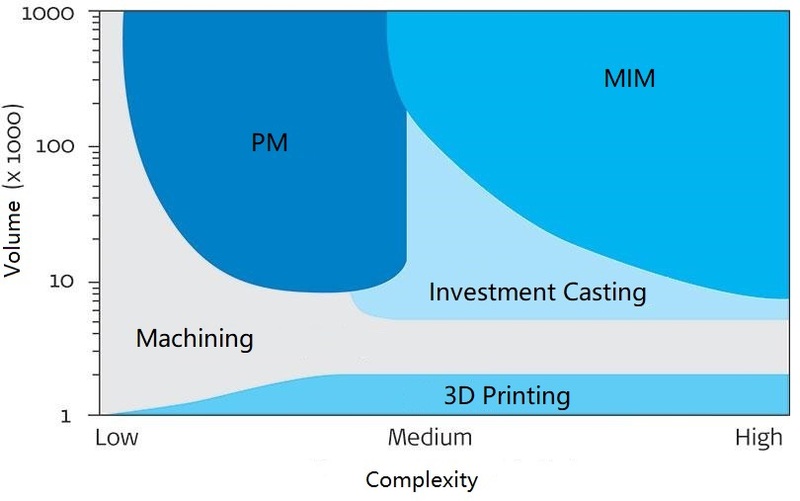 As illustrated on the graph, there must be a certain volume of components and a certain degree of complexity before it is relevant to choose the MIM technology ahead of the PM (Powder Metallurgy) technology. Tool costs will be higher for MIM than PM, but in solutions in which two or more sub-components can be replaced by a single MIM component, the higher tool costs will often be offset by savings in terms of materials, design, assembly and – not least – logistics. Even better suited to the MIM technology are solutions which involve functions or areas that are not fulfilled today, but which can be enhanced with the MIM technology. MIM can, for example, be used to produce new design details that optimise the solution. At FineMIM we have an example with a microscopic “hole” for pressure measurements or several examples with components that include batch number and logo. There are a huge number of possibilities. Increased strength may also be a requirement. The MIM process is ideal for components produced in plastic where greater strength is required. These components can now be produced in metal with the same degree of complexity. We recommend that you contact our specialists in the MIM area if you wish to have an evaluation of components and actual projects. The MIM technology is a complex area.